Tampa, FL – On the week, the national gas price average has dropped seven cents to land at $2.56. As pump prices steadily decline, they are headed toward some of the cheapest gas prices in 2018. The national average was lowest in January at $2.49 while May brought the most expensive price of $2.97. 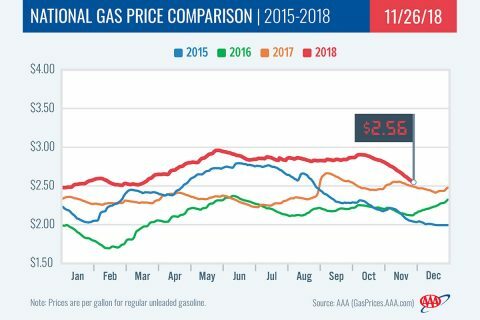 “Trends are indicating that the month of December may bring some of the cheapest gas prices of the year,” said Jeanette Casselano, AAA spokesperson. “Currently, 19 states already have gas price averages less expensive than a year ago so as U.S. gasoline demand remains low and supply plentiful, motorists can expect to save at the pump as long as the price of crude oil doesn’t spike,” stated Casselano. Gas prices have been cheaper in the U.S. as crude oil sells at $57.00/bbl and cheaper – the lowest prices of the year. However, market observers warn crude could see an increase following the Organization of Petroleum Exporting Countries (OPEC) meeting on December 6th in Vienna, Austria. At that meeting, OPEC is expected to curtail crude production by 1 million to 1.4 million barrels per day, which could cause crude prices to rise due to reduced global supply, in turn causing gas prices to turn higher in America. [320left]On the week, gas prices are as much as 14 cents cheaper in Ohio. Today, state gas price averages range from $2.58 in North Dakota to $2.18 in Missouri. 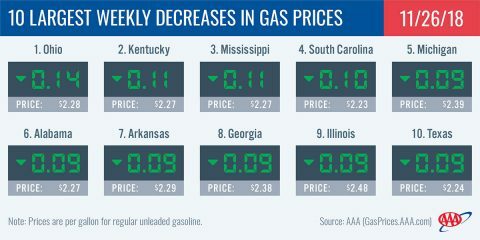 Across the Mid-Atlantic and Northeast states, gas prices are cheaper on the week with Washington, D.C. seeing the smallest decrease (-2 cents) and Tennessee seeing the largest decrease (-8 cents). 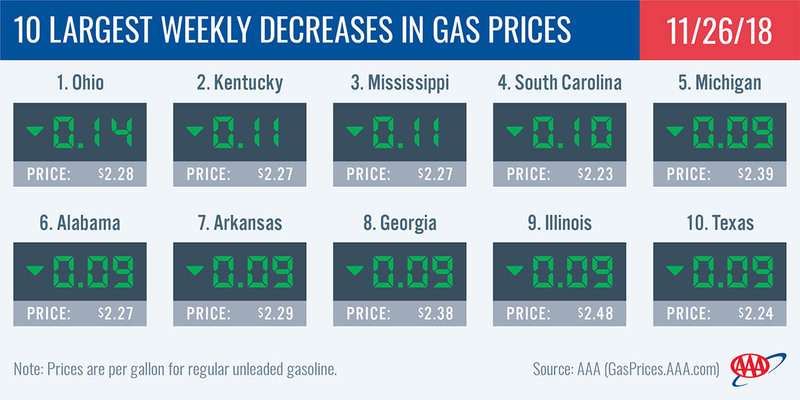 As pump prices continue to decline, all state averages remain well below the $3.00/gal mark – a vast change from this summer when Connecticut, New York, Pennsylvania and Washington, D.C. were routinely at this mark. [320right]Currently, five states in the region are enjoying pump prices that are cheaper year-over-year: Oklahoma (-7 cents), Louisiana (-6 cents), Florida (-4 cents), Texas (-3 cents) and South Carolina (-1 cent). At the close of Friday’s formal trading session on the NYMEX, WTI dropped $4.21 and settled at $50.42. Oil prices plunged to their lowest point since October 2017 last week as EIA reported that crude inventories continue to build. The latest EIA weekly petroleum report showed that crude inventories grew by 4.9 million bbl to 447 million bbl. [320right]Total domestic crude inventories have grown for nine consecutive weeks, contributing to the crude prices dropping further. If this week’s EIA report shows another build, crude prices will likely continue their descent.